The Guess Connect is an intriguing one. The hybrid watch is a result of the fashion brand's partnership with Martian. It sees Martian's alerts and voice tech on board a wristwatch, styled after Guess' best-selling Rigor model and comes in at a particularly pricey $379. So is this the answer to the smartwatch question? The idea works but the Guess Connect isn't reliable enough in use. We often write the words "looks like a real watch" in smartwatch reviews but in the Guess Connect's case it is also a real watch with a Japanese Quartz movement and nothing but a tiny display, side speaker and an LED to give away its connectedness from the outside. It's a mighty stylish, well built watch with a stainless steel case and in our case, a polished, rose gold finish with a blue top ring and dial. Our model came with a matching blue silicon strap, with a buckle, but one design features a fancy, brown crocodile leather strap. There is, in fact, a nice range of styles on offer, most of which look unisex. Each Connect watch has three buttons on the side, the middle of which is simply a crown for changing the time on the analog dial. 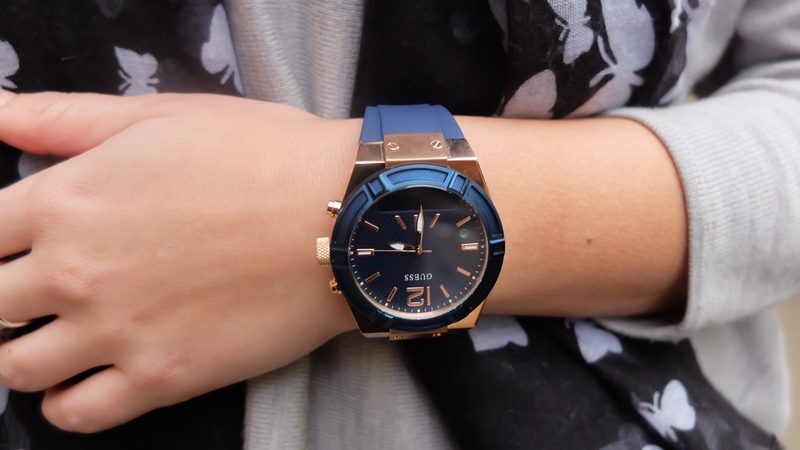 Initially we were told that the Guess Connect range would be water resistant but that no longer appears to be the case, according to specs listed on online retailers. It's comfortable enough though the case is a bit more rigid than some smaller, lighter smartwatches we've worn recently. Our one main problem is the chunk of this thing. It comes in 41mm and 45mm sizes, both around the same price, but each Connect watch is 15mm thick. The regular Guess Rigor watch, which this smartwatch is based on, is chunky enough itself but it's only 12mm. Moto 360 2: 11.4mm. Pebble Time Round: 7.5mm. Martian and Guess have a bit more work to do on this front. Our second issue, which we'll bring up now, is price. A "dumb" Guess Rigor watch - with the same build quality and brand power - can be picked up for around $150 and we think the mark up is too high for the features and performance on offer. Come on, it's double the price - are Guess fans going to pay that? With no digital display dominating the watch face, you will of course never find yourself with a blank screen on your wrist. A good thing. The tiny monochrome OLED screen sits neatly in the bottom fifth of the watch face and shows you the date, weather and alerts coming in from your smartphone. Alerts are the Guess Connect's bread and butter, as with all Martian powered watches, but we found the connectivity and reliability here to be a bit of a pain. We dropped our Bluetooth connection a couple of times and also had some trouble dismissing WhatsApp messages. Seriously, they wouldn't leave us alone, even though we were pressing the correct button - the 'down' or power button. Tapping on the watch glass to see our latest notification also didn't work every time. Disappointing. One nice thing is the customisable vibrations for alerts so you know exactly which app is buzzing you, more on that later. Voice controls are also more promising. The Connect hooks up to either Siri or Google Voice on your smartphone, it's compatible with both iPhone and Android, and you can access your voice assistant by pressing the 'up' button on the side of the watch. Thanks to the built-in speaker (and mic), you will get replies and confirmations from Siri or Google via the watch and the green LED will flash to show it's listening. One feature we'd forgotten about during testing was that the watch can actually take calls. We heard the voice on the other end of the call quite clearly though they struggled to hear us until we started speaking directly into the watch, spy style. There's no activity tracking, an area that Martian seems to be shunning at least for the moment. Other minor features which might come in handy include a Bluetooth leash, remote controls for music and the camera on your smartphone. Guess and Martian have created a Guess branded companion app for the Connect range but it's much the same as Martian's app. That is, simple to use but with a nice level of customisation. Choose which apps you want alerts for, sort out vibration patterns for each one and tweak everything from scroll speed to vibration intensity. You can also tweak date, time and weather formats and set alarms as well as turn on 'do not disturb'. Handily you can also do this on the watch by scrolling through the menu options until you get to DND. There's a fairly inoffensive microUSB port at the side of the Guess Connect, which is covered by a flap. That takes care of charging the Martian module which lasts four to five days in our experience. Considering the small size of the screen and the competition here such as the Pebble Time Steel (ten days) and the Vector Luna (30 days). Otherwise, the watch battery itself lasts two years according to Guess. Thanks to Watch Shop, the Guess Connect UK launch partner, for the review sample. In theory, the Guess Connect is the future of a certain type of wearable. Take something people already wear on their wrists - in this case, the Guess Rigor, and make it smart in a helpful but inoffensive way. As a first smartwatch, if you've got money to burn, this is a looker and won't embarrass you. But the Connect falls down on a number of points, it's 3mm chunkier than an already chunky 'dumb' timepiece, it's double the price and more expensive than even the basic Apple Watch. The Bluetooth dropping out and problems receiving and dealing with alerts get annoying. And considering the small, monochrome screen and limited functionality, the battery life for the smart part should be outperforming the likes of Pebble. The Guess Connect is worth a look but a cheaper Martian watch might make more sense for all but loyal Guess fans.